In Montessori, students are introduced to both arithmetic and geometry in Early Elementary. All concepts are introduced with concrete, self-correcting materials that encourage independence and confidence in their learning process. Through trial and error, students quickly learn to bridge the concrete materials with abstract concepts, such as addition, subtraction, place value, measurement and money. As students' skills develop, they move into more complex operations, like multiplication, division and concepts such as fractions and decimals. Math is just one of Early Elementary subjects that lends itself well to nature-based education. Students will often use natural materials that they collect on nature walks, such as rocks, acorns, pinecones, or flower petals, to perform basic arithmetic operations; in one unit, students practiced estimation using the seeds from pumpkins they carved! Outside, students may learn measurements by measuring snow depth or tree trunk circumference. In the Montessori curriculum, students learn the principles of geometry from an early age. In Early Elementary, students familiarize themselves with two and three dimensional geometric shapes, the basics of lines and angles, and calculating perimeters. 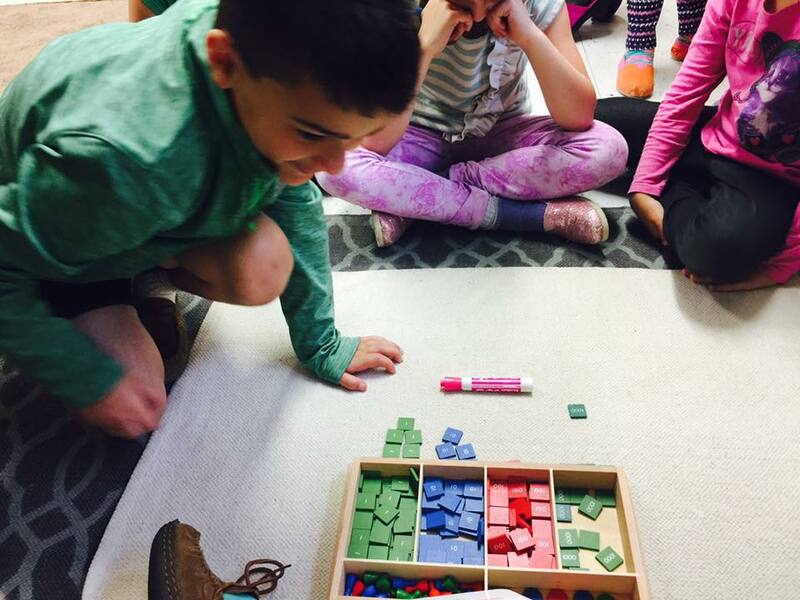 Students use hands-on Montessori materials, such as three dimensional solids, which allow students to a multi-sensory experience in their classroom learning. In our outdoor explorations, students are encouraged to bring these lessons to life, identifying cylinders in tree trunks, calculating the perimeter of our school gardens, or recognizing the changing angle of the sun throughout the day.